HMD Global today announced its most affordable Nokia-branded smartphone at an event held in Gurugram, India. The Nokia 2, as rumored, packs a huge battery that is claimed to deliver 2 days of battery life. It has been priced at roughly 99 EUR and will be going on sale in various markets around the world by the middle of November. Color options include Pewter Black, Pewter White and Copper Black. Unlike the more expensive Nokia smartphones released this year, the Nokia 2 does not feature a metal unibody build. Instead, it uses an aluminum frame in the middle and a polycarbonate back. It comes IP52 certified, which means you won’t have to worry about small splashes of water hitting the device. Dominating the front of the smartphone is a 5-inch HD LTPS LCD In-Cell Touch display with 720 x 1280 HD resolution and Corning Gorilla Glass 3 protection. The smartphone is powered by Qualcomm’s Snapdragon 212 quad-core mobile processor clocked at 1.3 GHz. Graphics are handled by the chip’s integrated Adreno 304 GPU, which isn’t very powerful. Like other entry-level Android smartphones on the market, the Nokia 2 is equipped with 1GB of LPDDR3 RAM and 8GB of internal storage. For further expansion, it includes a microSD card slot that will accept up to 128GB microSD cards. It should be noted that even the dual SIM variant includes a dedicated microSD card slot. Moving on to imaging, the Nokia 2 features an 8-megapixel autofocus camera at the rear, coupled with an LED flash. For selfies, you get a 5MP shooter on the front. 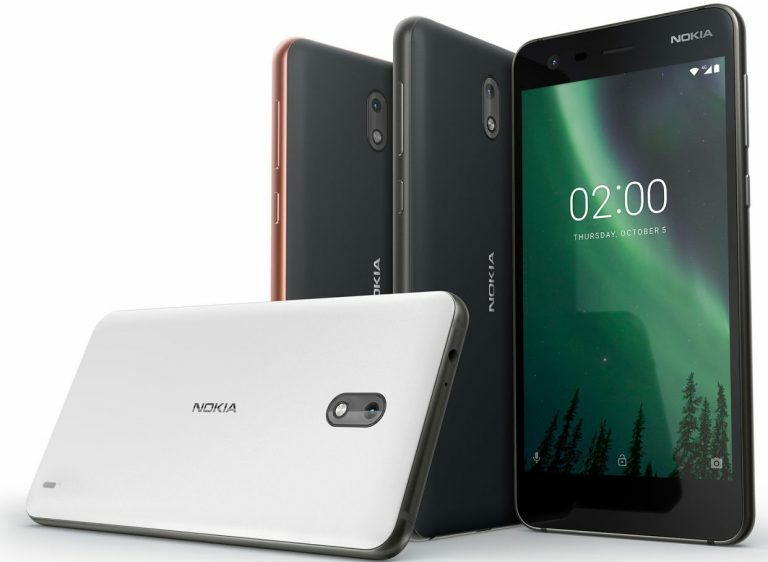 Connectivity features offered by the Nokia 2 include Wi-Fi 802.11 b/g/n, Bluetooth 4.1, GPS with GLONASS, and 4G LTE with VoLTE support. The main USP of the smartphone is undoubtedly the 4100mAh battery. However, there is no fast charging support, so it could take quite some time to get fully charged. In terms of software, the Nokia 2 will ship with the Android 7.1.1 Nougat operating system out of the box. HMD Global has assured that an update to Android 8.0 Oreo will be rolled out in the near future, along with monthly security updates. As for the dimensions, the handset measures 143.5 x 71.3 x 9.30mm.